The ruling forced D.C. to issue gun carry permits, but unlike the majority of states the District decided to implement a "may issue" law which requires applicants have a "good reason" to carry a firearm. The law leaves the final decision on who gets a permit up to Chief of Police Cathy Lanier, and requires $110 in application fees, 18 hours of firearms training, and a 90-day waiting period. 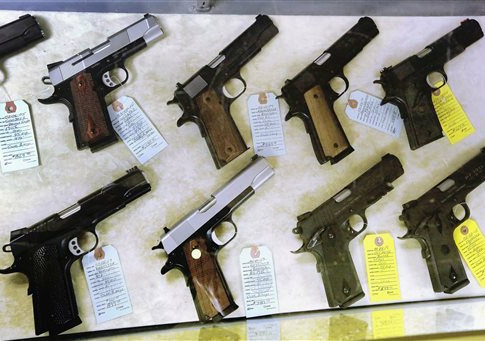 The law, among the most restrictive in the nation, has drawn repeated criticism from gun rights groups. In addition to the 16 applicants who were approved for a permit, Metropolitan Police Department spokeswoman Gwendolyn Crump said 31 were denied. She also said 76 applications had been submitted since the department began accepting them on October 23rd, 2014. Those 16 granted permits represent about .000025 percent of the 646,449 people the Census Bureau estimates reside in the city. The identities of those granted permits are protected by law, but WTTG’s Emily Miller publicly announced last night that she has been approved. Miller, who has written a book on her efforts to register a handgun in DC, has been documenting her attempt to get a gun carry permit for Fox 5 DC. "I was shocked to hear that I am the 15th person the police chief approved for a carry permit," Miller said in her latest report. While the district’s carry law remains one of the most restrictive in the country and far more people have been denied than approved, Miller sees at least some reason for optimism among those who wish to carry a firearm legally in the city. "No one could legally carry a gun in D.C. a year ago," she said in the report. "Today, there are 16 of us who may exercise our Second Amendment right to bear arms." This entry was posted in Issues and tagged 2nd Amendment, Concealed Carry, Gun Control, Washington. Bookmark the permalink.